I love a good Pinterest project, and if I can use both Beadalon products and metal stamps from my friends at ImpressArt, then it’s even better! Today’s Facebook Live on the Beadalon Page featured this adorable key chain made with a penny, a Beadalon Key Ring, and a Jump Ring. How easy is that? We made it even easier to follow along in our follow up YouTube Video. I found so many creative stamped designs by doing a quick Pinterest search – anniversaries, weddings, birthstones, etc. I especially loved the way someone assembled all of their souvenir pennies onto a key ring. I’m definitely doing that one on our next Disney trip. When a project leads to a rabbit hole of creativity, you know it’s a good one! I know I’m always struggling to come up with good projects for the men in my life. I hope this one inspires you to make something for the special dad in yours. Happy Father’s Day to my wonderful Daddy! Happy beading to you all! The Baby Jewel loom is small, but mighty! We had so much fun yesterday with our dual coast Facebook Live with Julianna C Avelar, inventor of the Baby Jewel Loom and Mama Jewel Loom. The Baby Jewel Loom is a great choice for beginning Loomers (like me!) because it’s always in the warp position – you don’t have to worry about getting the correct tension with the Rod like with the Mama Loom. It’s great for quick, smaller projects – and you can also make larger projects by sewing together multiple pieces. Check out Julianna’s latest book, Jewel Loom Inspirations for more project ideas. For this project, I used Size 6 Czech Seed Beads and 26 Gauge Champagne Artistic Wire. You can use all types of materials with the Looms, including (but not limited to) Leather Cord, WildFire, Hemp Cord, Beading Thread, Ribbon, Nymo and B-Lon. Pro Tip: To best thread WildFire onto the Jewel Loom Needle (or any needle), first use flat nosed pliers to flatten the WildFire. Then it should slide through the eye of the needle no problem! In addition to Seed Beads, you can use Swarovski Crystals, vintage beads, even gemstones in your designs. It was great having Julianna with us to help out, especially since I invariably mix up which are the Warps and which are the Wefts. The definitive answer from Julianna herself: The Warps are up and down, and the Wefts go side to side. I’m going to post that on my wall! The full instructions for the design that I made in the video are included with the Baby Jewel Loom, but Beadalon also has them posted on-line here! We love seeing your creations, so please post them on the Beadalon Facebook Page! Getting ready for Spring with a Bubbly, Crafty Project! It was a beautiful Spring day here in Pennsylvania yesterday, so we had class outside for this week’s Beadalon’s Facebook Live Video! One of the things Beadalon/ Artistic Wire specializes in is Heavy Gauge Wire – 10, 12 and 14 Gauges round out the category that spans from 10-34 Gauge. Originally, we were going to demonstrate a cool bangle bracelet (check in next week for that one! ), but it was so nice outside that we were inspired to blow some bubbles – and the 14 gauge Artistic Wire is perfect for making a whimsical, beaded bubble wand! I like using Memory Wire Shears to cut the thicker gauge wires. Because they are such a heavy duty cutter, they make it much easier to cut – and easy is good! I cut about 2.5 feet of 14 Gauge Tinned Copper Wire and wrapped it around a 3D Bracelet Jig, but any round object in the right size will work. Then, I made a wrapped loop to secure the circle into place. In the video, I used my hands to form one of the wands into a heart! Next, I added some beads – just find a few with holes large enough to fit over the wire. I used some sparkly beads from Jesse James Beads. Aren’t they fun? The last step is to make a spiral on the end of the wire to hold the beads into place. We learned the hard way that you need better bubble solution to make lasting bubbles with these big wands. Here’s a recipe that I found on the interwebs that looks like it would work. Here’s hoping that glorious weather is here to stay! Some of my best memories are from being a day camp counselor. Most of all, I loved the camp crafts, especially making friendship bracelets. Fast forward several many years, and I still love friendship bracelets, but now with a more grownup twist. Enter the Beadalon Tying Station – the perfect tool to use to make both old school and more “grown up” friendship bracelets. In this week’s Facebook Live Video, I talked about using the Tying Station with both B-Lon Bead Weaving Thread and Beadalon Bead Stringing Wire to fancy up your friendship bracelets. I love using the Tacky Mat to hold down my Tying Station. Incidentally, the Tacky Mat is great for holding down the Tassel Maker, too. The B-Lon is a great thread to use since it is strong, knots up well, and doesn’t stretch. And the Silver Color and Gold Color Beadalon Bead Stringing Wire makes the insides of crystals sparkle like you wouldn’t believe. Missed the Video? You can catch up on it and all of the past Facebook Live Videos on the Beadalon Facebook Page. We’re getting pretty good at sticking to Wednesdays at 3:00pm EST, so mark your calendars! Have something that you’d like to see me demonstrate on an upcoming video? Leave a comment and let me know! This week, I continued our series on Facebook Live on Memory Wire. 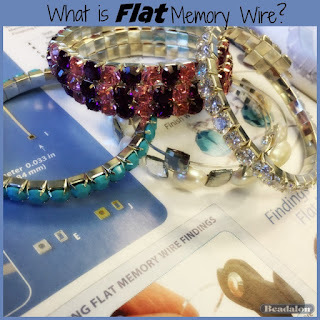 The first installation was back in December when I talked generally about Memory Wire, including how to use my favorite Magnetic Claps, but today I focused specifically on FLAT Memory Wire. The fun thing about the Flat Memory Wire is that there is a whole program of findings and components that go along with it. There are definitely benefits to using Flat Memory Wire including when you string up the components, because the Wire is flat, the components won’t spin around. The tops are always on top! There are three glue on components – a circle, an oval and a rectangle in Silver Plated and Gold Color. These are perfect for gluing all of the flat backed crystal and cab components that you have in your beading stash. The best glue to use is the Bead Fix 2-Part Epoxy, but a good alternative is Bead Fix Gel. In the video, I show how to glue size ss29 crystals and a really pretty square checkerboard crystal to the findings. The Head Pin Holder and Built-in Pin Flat Memory Wire Findings are a unique way to make your designs sit on top of the Memory Wire rather than strung onto the wire. I definitely want to use some pyramid beads to make an on-trend spiky bracelet. Make sure you leave more of the head pin than I did in the video if you want a bigger spiral! As much as I love the glue on and head pin components, the Cup Findings are my favorite part of this program! The ss29 Swarovski Crystal Flat Backs and Pointy Backs fit perfectly into the cup, and the Beadalon CZs in 6mm make for an outrageously sparkly faux tennis bracelet which would be perfect for a Bride….or another special occasion. Don’t forget – always use Memory Wire Shears to cut your Memory Wire! And the Memory Wire Finishing Pliers are a great way to turn loops on the end of the Memory Wire. You can also use Glue On End Cap made especially for the Flat Memory Wire to end your design. We just went over the schedule for the Facebook Live Videos for the next few months, and we have some really cool projects, tips, and tricks coming up! I hope you’ll continue to join us live, but you can always catch up on the Beadalon Facebook Page. See you next time and happy beading! There is always something new to learn here in the Beadalon offices – part of the reason why I am so grateful to be in the position that I am in! Today, I learned more about the Soumak Technique of Wire Weaving. Wyatt White demonstrated this interesting technique with Beadalon German Style Wire and Artistic Wires in yesterday’s Facebook Live Video presentation. He showed the basics here, and if you’re interested in kicking it up a notch, this is a great video that Wyatt did for Beadaholiqe that will take you through step by step. Wyatt mentions many different combinations of Wire to use for this technique, but a good place to start is with 16 gauge German Style Wire as the base wire and 24 Gauge Artistic Wire for the wrapping. After you’ve mastered the basics, you can switch it up as you’d like. Try using half round wire to wrap, use contrasting colors, even try to wrap with a thicker gauge wire over a thinner one! Try a single wrap, a double wrap, or a triple wrap. After you’ve prepared your straight wire, then you can use it to make a ring, a bracelet, or wrap a stone and make a pendant. Wyatt White is a treasure trove of information, and we are so lucky that he shares his techniques and amazing designs with us. Check out the video for a quick and dirty demonstration of the Soumak Wire Weaving Technique, then practice and practice some more! I resolved to do more wire working in 2017, and this is definitely a technique that I’m going to try more of this year! Every once in a while, a product comes along that is truly a game changer. Most recently for me, that’s the Beadalon Spin-n-Bead Quick Change Trays. Adrienne Gaskell came up with the idea as a way to make it easier to string up beads for making Kumohimo Braided Ropes, but I immediately jumped on the bandwagon for another use – making French Beaded Flowers. Some of you may know that my love of beading was reignited almost 20 years ago (gasp!) when I started making these gorgeous flowers out of tiny seed beads. It’s amazing the difference a few decades makes in the abundance of information. Back then, there was no Pinterest, no Instagram, but a small community of incredibly talented and generous people who shared their knowledge and resources. Fast forward these many years, and I get to have a hand in creating a tool that makes switching out beads for designing in different colors immediate. Ah.Maze.Ing! Whatever you use them for, I think you’ll agree that the Quick Change Trays are are as ingenious as they are simple to use. Simply pour your beads in the bowl of either the Spin-n-Bead or the Spin-n-Bead Jr., then use a curved needle with thread, or 22 or 24 gauge Artistic Wire, to load your beads. When you want to change colors, just add the beads to a Quick Change Tray and place it over the spoke in the center of the Spin-n-Bead Tool. When you want to switch colors back, just take it off again. Voila! A few weeks ago, I featured the Quick Change Trays on Beadalon’s weekly Facebook Live Video. I take you through a few different uses, and even show how to make a simple flower. There are a ton of resources and inspiration out there now on making the flowers. It’s a technique with a rich history and hopefully a future made even brighter with the introduction of this new tool!